As if the recent revelation that Super Street Fighter II with online play is coming west, there's a double-whammy of good Capcom VC news as rumours also point to a Western release for Strider. Siliconera reports both games are now confirmed for release outside Japan, but so far only SSFII has been officially announced by Capcom. We've approached the publisher for clarification and will update you if and when we hear more. That box art is just hilarious. I love old box art. Its got all the same madness as old science fiction book covers. Yes! I love Strider, so this would be awesome. Weird business plan by Capcom, wait til the service is 99% dead to start adding new games. If I still used my Wii I'd buy this, but I don't. Great news! This is one of my favourite Mega Drive games of all time, wonder why its taken so long!! I never understood that box art with the random white guy. What I wanna know is why has it taken this long for any VC games to be even considered for release? The Wii might have another year to go. Let's not abandon it just yet. Not everyone is gonna go out and buy a Wii U on day one. it's good that games are finally coming out, but we shouldn't have had this long drought of V.C games to begin with. let's hope more and more will be added to the upcoming list, not just strider, super streetfighter 2 turbo. Such a great old school game. Can't wait for this one. I'm fond of the Genesis version cause I like the music better than the arcade. Anyway I believe it when I see it. I remember talking about this game hitting VC 4 years ago. Isn't there also the arcade version with the 'potential' for a VC release too? Speaking of box art, wizards and warriors 2 had fabio on the front ... pretty funny. I played the arcade game and did not like it that much. Never played this i hope it does come out so i can play it. Don't forget Capcom also rated Mega Man X2 not too long ago. @Dazza Ditto! Wouldn't mind seeing this on the 3DS and over mobile platforms, too. One of the best Genesis games! Like some others, I will believe it when I see it. Wish it was the arcade version, but still will buy. My guess is that the queue of VC games ready to be released in NA/EU is drastically low and rather then release one game as soon as its ready with weeks of nothing in between, they're building up a bigger queue so they can do consistent releases. And if that's true, I wouldn't hold it against them. Alternatively: Blame Namco for whatever reason is holding them back on putting their Arcade games out everywhere else. Alternatively 2: Blame D4 for whatever reason is holding them back on putting their recent NeoGeo releases out everywhere. I have some hope that they'll pull through eventually though. 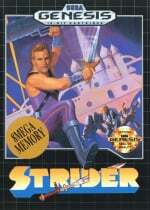 why dont Capcom just release the Arcade Version of Strider on the VC instead of the Megadrive Version because that would make better sense. This may sound a bit dramatic, but Strider has a definite place in my Top Five games of all time, and I mean that sincerely. I understand that gamers are comparing the arcade with the Mega Drive conversion here, but we can't really lose, both games are equally brilliant. There is a general consensus that the Mega Drive version managed to have an even better rendition of what is an epic and hugely atmospheric retro game soundtrack. 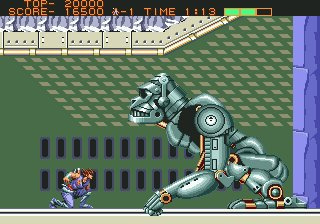 However, the arcade game had slightly stronger graphics, the Mega Drive conversion glitches more, for example the huge metallic ape sprite glitches when you battle it early in level two. The arcade game has bigger, chunkier sprites, because it does not have the black border at the top of the screen, that the Mega Drive game used for the status bar. I have a Japanese boxed Mega Drive version of Strider, with wonderful box and instruction art. I also have many versions of it on the Capcom collections for PS2 and PSP, as well a bonus disc of the arcade version, which came with the PSone conversion Strider 2. However, this potential Virtual Console release will deservedly bring Strider to the masses. If I was a modern Nintendo Wii gamer, I think that I would buzz off having the chance to experience such a wonderful retro game. Great news, @James! If you are a modern gamer who gets the chance to experience this game for the first time, please play it with consideration of the fact that it is 22 years old. Strider was a jaw-dropping and completely stunning arcade gaming experience in 1989. Ok, let's see... Double Dragon II and this = the most excited for Wii VC games in a long time. @JamieO An excellent summary of Strider! The Japanese box art was stunning and much more appealing than the European edition. I would love to see this on the 3DS. But still, it's good to hear that this classic is getting a re-release. Wish it was the arcade version but this is still good news. i remember paying £45 for Strider for the Megadrive in 1990 ouch,and now u can have the Arcade Version on Mame for free,how times have changed.